We are a web solutions studio, specializing in custom applications, integrations, and modernization. Have an idea for a web application? We can help bring it to fruition, from conception and planning to launch. Is your data too separated, or being duplicated across multiple systems? Get them connected and avoid data integrity issues. Our consultancy and product services can assist in finding opportunities for optimization within your current technology stack. The slower your app is, the less work you can get done. We make sure you have the performance for real-world usage. Is your business struggling with your current application? Push for rapid growth with a revitalized solution. Web applications are fully responsive, working across all devices. Take advantage of modern convenient devices. 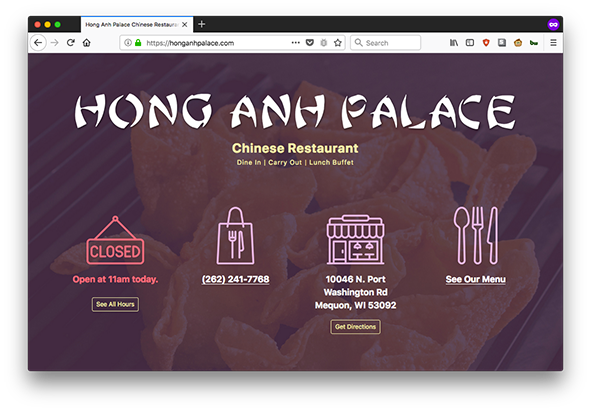 A single-page informational website for a local Chinese restaurant.